For a new Coyote motor in the old new edge, the stock K member is simply not up to snuff — mainly, it’s taking up space that the oil pan and headers want to use, which is unfortunate. The stock K-member is a porker — it weighs a lot and gets in the way of any kind of decent set of headers. Add the fact that the weight is right over the front wheels, and that the Mustang is a front-heavy car, and you have nothing but positive news if you swap it for an aftermarket K-member. QA1: Looks like a decent choice — but the unit is made in china of mild steel and appears to be of inferior quality compared to the UPR or Maximum Motor sports units. I might have gone with MM instead though, if I hadn’t chosen UPR — the UPR unit is made in the USA and after talking with Adam Bennett at UPR products, I chose their coil-over conversion kit, which would allow me to keep my existing KYB adjustable struts and steeda camber/caster plates. This is the kit I ended up getting. I also opted for a 3/8″ spacer kit, just in case I needed more space in the engine bay (prolly a good hedge there) and a spanner wrench to adjust the ride height of the front of the vehicle. The kit is on order, and expected arrival sometime next week. One of my goals for this project is to lower the weight of the vehicle and this unit will give me that and valuable space under the engine for the (factory) shorty headers and larger oil pan. Sad news — in 1998, Ford decided to make the fuel-injection delivery system for the Mustang a bit cheaper. They eliminated the fuel line that returns fuel to the tank, cheapened the fuel tank baffles (eliminated them from what I can tell), and rigged the fuel delivery pump to only pump when commanded by the PCM. From what I understand, the PCM monitors the pressure at the regulator near the engine, and signals the fuel pump every couple of seconds to continue pumping. This saved them some cash — and made a weaker fuel delivery system. Did it work? I have no real complaints with the 2000 GT (which has this system) — it’s never really left me by the side of the road. Unfortunately, everything I’ve read says that this system is not good enough to make serious horsepower, and from the perspective of quality — the fuel at the front of the car can get warm, and there’s no way to circulate it back to the tank for a cooling off. To remedy this situation I have a new fuel system on order from High Flow Performance (You can reach them at 1-818-574-FUEL). The system pointed to by that link there is almost what I needed — sans fuel tank and neck. I ordered the fuel tank from ebay (90 bucks delivered) for a 94-97 Mustang, which has the right baffles and will accept the fuel system from High Flow. They are making this system specifically for my car (it was a special request, by me, for this build), which was really cool of them, since the system specified is mainly for a Coyote in a Fox body and the new edge Mustangs (like my 2000 GT) have a longer body than those cars. The parts are on order as I write this, due to arrive sometime in the next couple of weeks. The fuel tank is in, and I went to a bone yard (one of those you-pull-it-yourself places) for the neck and a couple of other minor parts that won’t be included. I’ve also ordered a stant “cap-less” fuel cap for the car, which means I won’t have to worry about pulling off or putting on the fuel cap after I get this system installed! As soon as I can get pictures of all of this I’ll get them up here. In the mean time, I’ve got a big batch of other stuff to get corralled into the garage where I will be doing this build. I’m not 100% certain that my fuel woes are over — but with the guys from HPF on board, I think I’m in good hands here. It’s been about 3 to 4 months since I decided to embark upon the mission, and lemme tell ya, it’s not cheap. Hopefully, it will be worth it in the end. First, there’s the car. 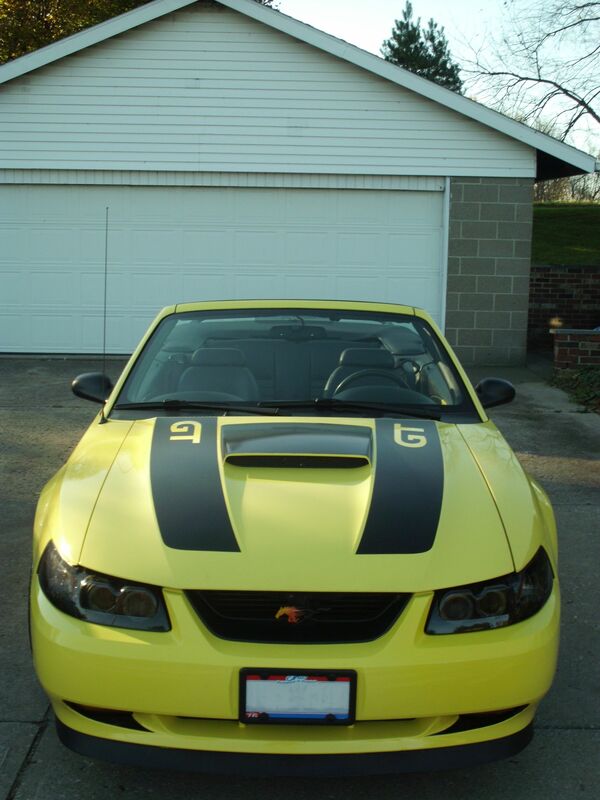 In July of 2000 I purchased a rather rare (albeit, mundane), Spring Feature Mustang GT. This car has been through a lot. At over 170 thousand miles, countless customizations, many road trips and mostly good times, it’s not a car I’m willing to part with anytime soon. Over the years I’ve explored a few options toward the goal of making it faster — but mostly, just safer. As each new Mustang model year rolled by, I witnessed more power to the GTs — and then in 2011, something amazing happened. Ford went all-out. Dual overhead cams, variable valve timing — piston oil squirters! The Coyote emerged as a world-class engine. An engine that would bolt right into my car (well, more on that later) and exceed the horsepower rating of the 2003-2004 Terminator Cobras, all the while more efficient and lighter than said legendary motors. And so I began exploring what this “swap” would take — at first with enthusiasm. Each revelation was a downer. The 1999-2004 Mustangs contain quite a few “hidden” compromises, it seems. Each of the items I uncovered made me realize that this is no ordinary swap — it’s quite involved, for that matter. What I really realized though, was that each of the items required to swap to the Coyote was something that would be a definite step in the right direction for my aging 2000 GT. The fuel system, the front suspension and k-member, the gauges and the exhaust would all be problematic. While Ford had made the Coyote within the space and form-factor boundaries, the SN95 Mustangs have some serious limitations that would have to be addressed in order to do the swap properly. I realized after doing quite a lot of research and reading about other people’s endeavors (nightmares for some), that I was in for a real ride attempting this swap. It hasn’t been done for a lot of 99-04 GTs, for that matter. I’m certain that some of the reasons for this have to do with cost — for quite a lot less money you can buy a blower kit or a nitrous bottle and get some serious boost. You get that boost at the cost of efficiency and you don’t get a warranty — and you don’t really improve the overall solution of what the car could be (my opinions here — worth exactly what it’s costing you to read this page). Either there were not that many people talking, or there were not a lot of people doing the swap — in any case, it’s fairly fresh ground as of the writing of this post. I also realized that I was uniquely in a space to try it myself. Little known fact here: although my job entails enterprise-class deployments of software and a specialization with free software (Linux in particular) — I happen to possess a degree in mechanical engineering. And I have friends — one in particular, a certified Ford mechanic with a similar enthusiasm for SN95 Mustangs. I would learn a lot about my car. Due to the above, I be in a better space to modify it further later in the life of the vehicle. Efficiency: The new motor appears to be 20-30% more efficient than the old one. Horsepower: It’s way more powerful than the engine that came in the car, stock. Balance: Taking weight off the front of the car will potentially vastly improve the weight distribution of the car. Warranty: I get a two-year, 24k mile limited warranty on a car that effectively has none at the moment. Opportunity: I get a chance to improve the little things about the car that have aged due to the advancement of automotive tech in general over the years. For all of the above reasons, I’m setting forth here. All of the experiences will be documented and compiled into a book form for those of you that want to attempt something similar. This will be the location where you can come and read about what is going on next — coyotify.com is meant to be a community site. Those of you that want to post experiences and talk about what’s going on are very welcome. My next blog post will talk about site policy and intentions further than this short teaser — for now, know that I’m on a journey, and you’re all welcome to come along for the ride.